The AWEX EMI closed on 1849c – down 11c at Auction sales in Australia. In the northern region, the Merino MPG’s increased in price whilst crossbred gave back most of the previous week’s substantial rises. Currency exchange weakened by .9% over the week with little effect on the markets direction as uncertain factors of both supply and demand took control. Merino Fleece were generally 10-30c dearer, which was heavily driven by the best style and measured lots. The superfine offering fully captured the buyers’ attention, pushing prices up well in excess of the MPG movements. Merino Skirtings followed the fleece trend with the low VM and best measured lots, finding the purchasers favour over the poorer and style heavy VM lots. The Merino Cardings indicator checked this week after a 3 week price recovery period posting losses of between 7 and 20c across the selling centres with Locks, Crutchings and Stains falling 10-20c. Crossbreds fell foul to the greatest buyer pressure. After posting substantial gains in the previous two weeks, 26μ gave back 115-130c whilst 28μ fell 96c and 30μ down 70c. These sharp falls resulted in a 20% pass in rate for the XB sector, dragging the national pass in rate up to 10.3%. Commentary: This week there was some interesting dynamics as the Large Chinese Indent buyers were heavily contested on almost every lot by local traders, who seem to portray a “buy at all cost” strategy. 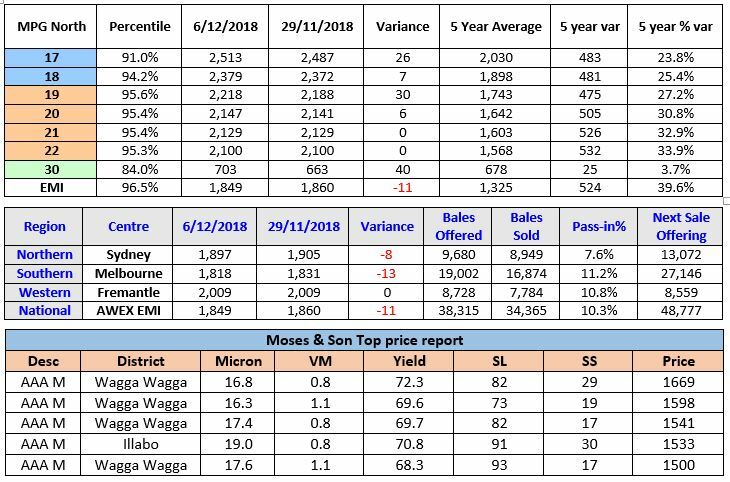 The supply alarm bells were certainly ringing loudly as the AWTA released their November kgs samples down 21.1% compared to the same period last year and a whopping 12.6% less Year on year for the season to date. When coupled with the sales figure through auction being down 18.5% in bales and 20.8% in clean kg terms, it places huge pressure on our processor customers to keep the machines running. Especially when we know that the current figures could be flattered by the progressively increasing numbers of sheep being shorn early and sold for slaughter as a result of the ongoing mother of all droughts.